Smokebreak is a rare example of large multi-figured painting by Victor Ivanov not in a Russian museum. 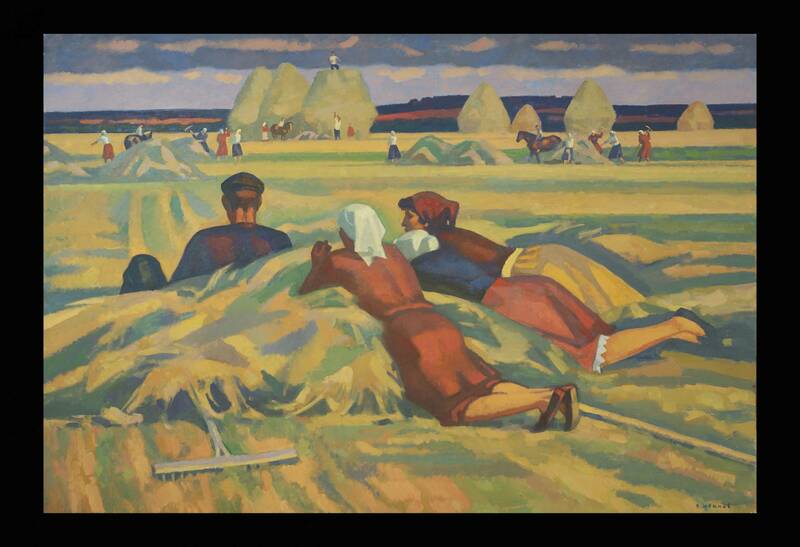 3 women and a man lie on the freshly cut hay taking a break from the grueling harvest in the Ryazan sunshine. All the work is being done by hand or with the help of horses. The composition is carefully and geometrically balanced in Victor Ivanov's distinctive linear style. The painting is a masterpiece of the post war 'Severe style' which was developed by artists such as Ivanov, Petr Ossovski and Geli Korzhev. 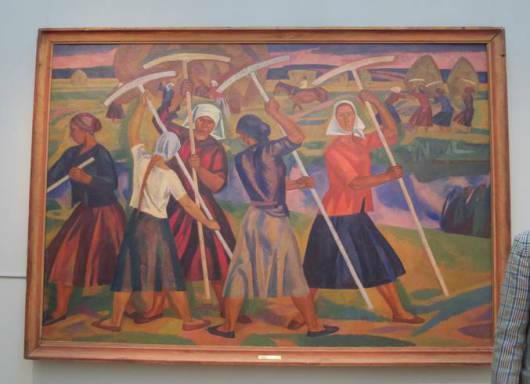 The 'Severe style' was partially a reaction against the cheerfulness of the approved Socialist Realism that these artists felt was inappropriate in the austerity of post war Moscow. It was after Stalin's death in 1953 and the during the Khrushchev thaw that artist's such as Ivanov were able to start experimenting in this style which would have been unthinkable a mere decade earlier. Victor Ivanov said in an interview in 2009 that this painting is from his 'Mothers of Russia' series which includes the famous work 'Women harvesting' in the Tretyakov. The painting is a tightly controlled exercise in colour, form and has a carefully balanced composition. Ivanov eliminates all non essential detail. The painting is pieced together in thick blocks of colour that are cleverly matched to create a harmonious whole. Ivanov acknowledges his debt to Malevich and Goncharova and yet the painting is clearly of its time and original. Victor Ivanovich Ivanov spent much of his life, and had a summer house near, Ryazan where his mother was born, and where the Victor Ivanov museum is now to be found attached to the Ryazan State Museum. Ryazan became the main inspiration for his art and he formed a deep attachment to the people and the land in this area. In the villages, all human life was there from the first day till the last. Smokebreak is a outstanding example of Victor Ivanov's habit of drawing his subject matter from the local people working in the fields near Ryazan. Such paintings have an eternal quality where time is suspended. The colours are harmonious and dense and the painting has a peaceful air.